Surgeons of The Vision Center at Children’s Hospital Los Angeles completed a revolutionary gene replacement procedure on Tuesday, March 20 at 9:20 AM, to restore vision in a patient with retinal degeneration, using the first gene therapy ever approved for a genetic condition in the United States. "We are pleased to be able to offer this therapy that can truly impact a patient’s quality of life and, potentially, help them see their future through ‘new eyes’," said Thomas C. Lee, MD, director of The Vision Center at CHLA and associate professor of ophthalmology at the USC Roski Eye Institute. 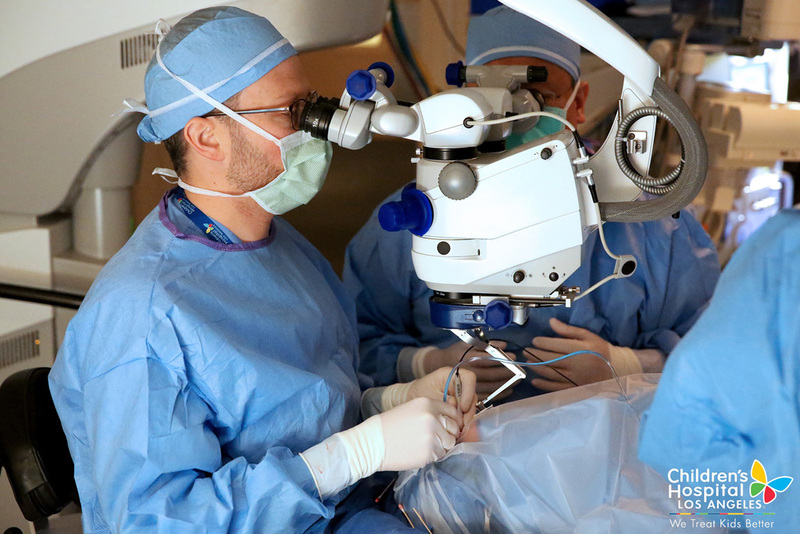 Of the seven hospitals nationwide approved to deliver this therapy to patients, CHLA is the only one with two full-time, dedicated pediatric retinal surgeons on site — Aaron Nagiel, MD, PhD and Lee. CHLA also is home to the Center for Personalized Medicine, where a laboratory certified by the Clinical Laboratory Improvement Amendments (CLIA) can do the necessary genetic testing for potential patients to determine if they have the defective RPE65 gene. Although Nagiel and Lee specialize in treating children and adolescents, the first patient to undergo the gene replacement procedure at CHLA on March 20 was an adult. The patient was unable to access the revolutionary therapy at a facility closer to his home, so CHLA's Vision Center offered their expertise in order to bridge this gap. "This inherited condition begins to manifest during childhood and adolescence,” said Nagiel, who also heads a predictive medicine research program at CHLA that is working toward the next breakthroughs in restoring functional sight. “But since there has been no available treatment, there is a tremendous backlog of people who have been waiting many years, and we want to help respond to that urgent need." The vision-restoring RPE65 gene therapy, marketed as LUXTURNA™, was developed by Spark Therapeutics. The procedure gained marketing approval from the U.S. Food and Drug Administration in 2017 for both children and adults with a defective RPE65 gene. Children's Hospital Los Angeles has been named the best children’s hospital in California and among the best in the nation for clinical excellence with its selection to the prestigious US News & World Report Honor Roll. Children’s Hospital is home to The Saban Research Institute, one of the largest and most productive pediatric research facilities in the United States, is one of America's premier teaching hospitals and has been affiliated with the Keck School of Medicine of the University of Southern California since 1932.